Tonight i almost left the stage as my bass amp blew a fuse, however i was trumped by Paul whose turn it was tonight to freak out when he smashed a bottle of beer by his kit and stormed off stage and then later threatened to leave the bus if Geordie swore at him again on stage, i understand how he feels as Jaz routinely swears at me onstage if play a note different from the record , i usually ignore him and turn up and play even more differently but sometimes the very public humiliation is too much. I miss that, when on the Pandemonium and earlier tours we had more of a psychedelic/spontaneous vibe to the performances, i think Jaz gets confused if we go off piste too much and also his classical work is very regimented and that spills into the band sometimes….If i could persuade the band, we would be doing a different set every night, but so far I had an idea last night that Geords liked, of getting a VJ in to do some psychedelic projection visuals while we play, will see how far this goes with rest of band and management. 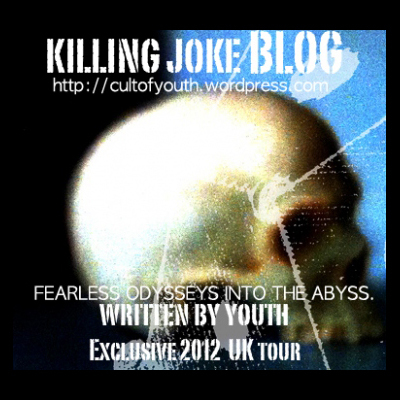 read more on the cultofyouth.